The West Urban Community- Wastewater Collection System Master Servicing Plan Study completed in July 2012 recommended construction of the “Stittsville/Fernbank Diversion Trunk Sewer” to send wastewater flows to the Kanata West Pumping Station (KWPS) and reduce flows to the existing Hazeldean Pumping Station (HPS), eliminating the need for further HPS expansion for this growing development area. As a result, the City of Ottawa is undertaking the preliminary and detailed design for the 900 mm diameter Stittsville Diversion Trunk Sewer (SDTS), which will divert wastewater from the Stittsville trunk sewer and convey the flow to the Kanata West Pumping Station (KWPS). Construction of the SDTS is expected to start in the fall of 2018 and will be substantially complete late in 2019. The alignment of the SDTS includes a diversion chamber on the Stittsville Trunk Sewer at Abbott Street. The proposed alignment extends north through the Fernbank Community lands along the north-south arterial/transitway corridor (future Robert Grant Avenue). Crossing under Hazeldean Road and Poole Creek, the diversion sewer will turn east on Maple Grove Road and tie into an existing sewer stub for KWPS. A public information session is expected to be held in the summer of 2018, to present the design drawings, proposed construction methodology and schedule to the public. At this time attendees will be able to view the design, ask questions and provide comments on the construction impact of the proposed works. Beginning on Thursday April 11, the City will begin construction work on the new Stittsville Diversion Trunk Sewer. 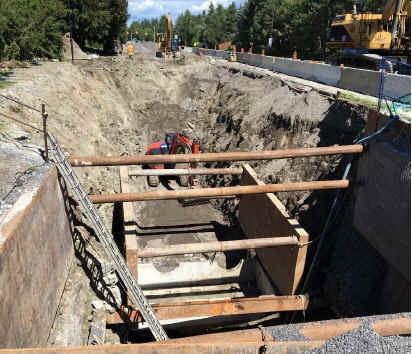 The new trunk sewer connects to the existing Stittsville sewer at the intersection of Abbott Street east and Robert Grant Avenue and flows north to Maple Grove Road, where it connects to the existing Maple Grove trunk sewer just west of Poole Creek. Most of the work is within the unopened Robert Grant Avenue right of way, except for the diversion structure on Abbott Street east and again along Maple Grove Road from the unopened Robert Grant Avenue right of way to the west side of Poole Creek. Who: The City of Ottawa has retained the Contractor, Taggart Construction Ltd., to complete the work. 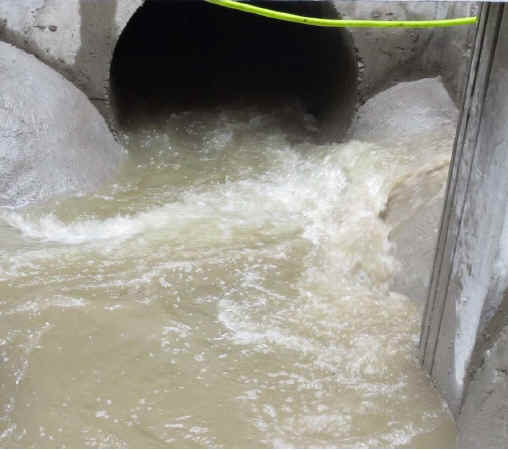 Why: The new sewer will send wastewater to the new Kanata West Pumping Station, reducing flows to the existing Hazeldean Pumping Station, eliminating the need for further expansion of the Hazeldean Pumping Station. What: Work involves construction of a new diversion chamber on Abbott Street east, east of Iber Road, open cut sewer construction along the unopened Robert Grant Avenue right of way and Maple Grove Road to Poole Creek, and trenchless sewer construction under Hazeldean Road. When: The construction work is tentatively scheduled to begin the second week of April and is scheduled to be completed by end of summer 2020. Where: The location of the sanitary sewer is shown on the figure below. The Contractor will take every precaution to minimize interruptions to the everyday life of your family and/or operation of your business, but, as you can appreciate, there may be some inconvenience during the work, such as traffic delays, parking restrictions, and noise. We would like to thank you for your patience and co-operation. As part of this contract, the Contractor is assuming full responsibility for the construction work until it is entirely complete as well as any damages to private property resulting from these construction activities. In the event of such occurrences, all claims for damages should be immediately reported both verbally and in writing to the Contractor and to the City’s Contract Administrator. This will ensure prompt notification of appropriate authorities to complete the claim investigations. For any emergency outside normal working hours on weekdays and weekends, call the City at 3-1-1. Welcome to the public information session for the Stittsville Diversion Trunk Sewer Project. The purpose of this public information session is to present the project background, construction methods, and to inform residents of the upcoming construction activities and schedule. Please feel free to circulate, review the information presented, discuss issues with the City and the design team and to provide your comments. Hazeldean pump station currently receives flow from the Stittsville, Bridlewood, Kanata South Business Park, Glen Cairn, and Katimavik/ Hazeldean communities. It is one of the City’s largest sanitary pumping facilities. Significant expansion of Hazeldean pump station is required to meet projected 2030 sewer flows. Kanata west pump station (recently completed at 1590 Maple Grove Road) was constructed to relieve the pressure on Hazeldean pump station. Stittsville diversion trunk sewer provides a gravity flow link between the two facilities. It allows Kanata west pump station to accept flows from roughly half of Hazeldean pump station’s current sewer catchment and defer costly expansions. The diversion trunk sewer will follow the future alignment of Robert Grant Avenue between Abbott Street and Maple Grove Road. Two areas of rock removal are expected. High strength bedrock has been identified requiring blasting, or line drilling and hoe ramming techniques. No blasting will be permitted during school hours. Pre-inspection will be offered for those buildings within 75 metres of the rock removal. Notifications of rock removal activities will be provided to residents and businesses located within 150 metres. Rock removal activities will be monitored and adjusted to ensure that noise levels and vibrations felt at nearby buildings are kept under established thresholds. Dust Dust suppression using water trucks. The City of Ottawa invites you to a public information session to view information with respect to the Stittsville diversion trunk sewer project that is planned to begin fall 2018, subject to approvals, with completion in Spring 2020. Design drawings will be on display for your viewing. Staff will also be on hand to provide information and receive comments. Why: The West Urban Community - Wastewater Collection System Master Servicing Plan Study completed in July 2012 recommended construction of the “Stittsville/Fernbank Diversion Trunk Sewer” to send wastewater flows to the Kanata west pumping station and reduce flows to the existing Hazeldean pumping station, eliminating the need for further Hazeldean pumping station expansion for this growing development area. What: The 900 millimetre diameter Stittsville diversion trunk sewer will divert wastewater from the existing Stittsville trunk sewer on Abbott Street and will convey the flow to the Kanata west pumping station. When: The design is nearing completion. 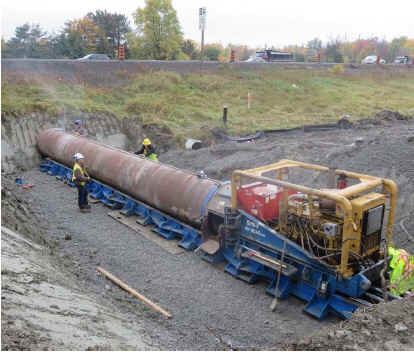 Construction of the Stittsville diversion trunk sewer is expected to start in the fall of 2018 and will be substantially complete late in 2019, with surface restoration complete in the spring of 2020. Where: From the existing roundabout on Abbott Street, the proposed alignment extends north through the Fernbank community lands along the north-south arterial/transitway corridor (future Robert Grant Avenue). Crossing under Hazeldean Road and Poole Creek, the diversion sewer will turn east on Maple Grove Road and tie into an existing sewer stub for Kanata west pumping station. Drainage area plans for the Hazeldean pumping station and Kanata west pumping station will be on display for information purposes. City staff and the project consultant will be on hand to discuss the project, construction impacts and to respond to questions. Accessibility is an important consideration for the City of Ottawa. If you require special accommodation, please contact Craig Anderson. If you are not available to attend the meeting or would like additional information, please direct your comments to the City of Ottawa senior project manager listed below.